The City (as most cities) doesn’t have any resources to perform the logistics of a relocation, so when anyone calls the City (or County) for help, they will exterminate (public safety reasons). What happens next depends on the numbers. They will not usually attempt to reoccupy a sprayed nest, but they tend to gather nearby, similar to what happens during normal swarming (when a hive gets too crowded and they generate one more queen and the old one takes 1/2 the colony with her to make a new hive). But in the case there is no queen (because she’s been killed by the insecticide), the existing workers will still swarm, and relocate and attempt to re-raise a new queen within that 5 week timespan. If there were one or two drones left in the mix, they can impregnate a worker (who normally could only lay infertile eggs) and begin rearing a new queen (by feeding royal jelly and propolis to the larvae). Otherwise, that particular colony just gradually dies off because the workers need sufficient numbers to maintain sufficient heat inside a new hive to raise the larvae. (workers can gather food, produce drones/males and build wax, but they can’t lay eggs as fast as a queen to regenerate an entire colony). The smell attracts the remaining foragers and they will usually try to rebuild the colony inside the box. (which is how we end up adopting new feral colonies, if it’s not swarming season.) We can use the same technique to “capture” a wild swarm (they dont’ sting when they’re swarming because there’s no new home to protect yet). By basically taking an empty frame box and making it smell good to them and placing (or dumping) the swarm directly into the box with frames for them to build comb upon. 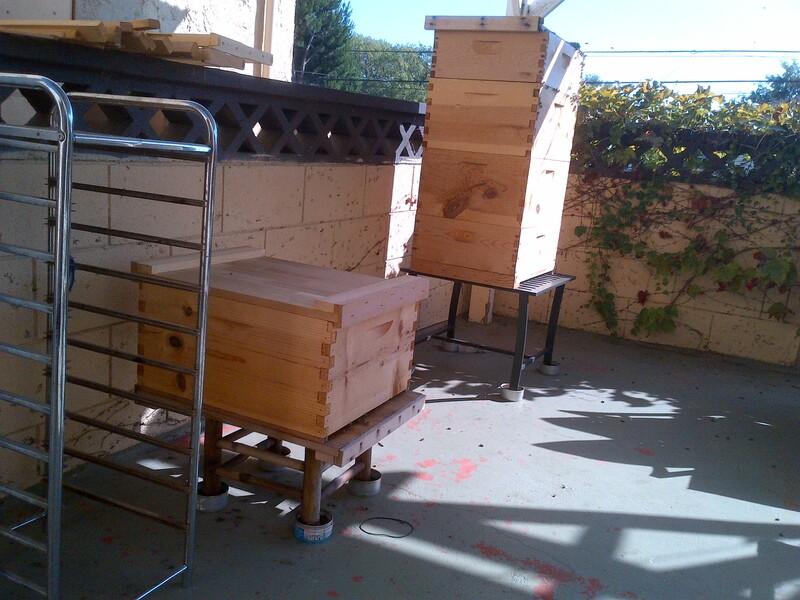 Without the frames, they will just attach their comb to the top of the box and build a naturally-shaped hive. You can also contact http://honeylove.org/ – which is our new parent organization throughout Southern California. Go Bees! nb: a friend said this was useful to them, and thought it would be nice to have a permanent place to post it for people to refer to in the future. A gentle article about urban beekeeping, health and skin care bee-related product development and the cosmetics industry impacts on bee survival. The August 2012 Nirvana, the monthly publication of Shinnyo-en, actually deals in depth with the subject of last month’s podcast – The Dharma Crisis. So rather than duplicating a discussion of what is already available in the August issue, we will focus instead on a subject very near to the heart of the Teachings – in our modern world, learning to value and appreciate Life, and placing less importance on material things. As many of you know, I am also a beekeeper, or bee-tender, as I discover my self to be, since I’ve discovered it’s pretty much impossible to keep a bee from going where it wants to go. ** I had been a long way on my journey of studies of Buddhist practices when bees entered my path through connection with the Backwards Beekeepers – a group dedicated to the treatment-free and organic practice of raising bees. What I didn’t know when my journey with bees started, was how much I could learn from them and myself about the natural order of things. One thing I’ve observed, is that people behave a lot like bees. If you look around your local CostCo store, or a busy mall during the holidays, you’re looking at human-sized bee colony behavior. Bees like surrounding something interesting, whether it’s a queen, or another bee telling where it found a great deal of pollen. Similarly, when you notice people gathered around a food sample station, or a celebrity shows up in a public place, you’re observing the same bee behavior, including the cacophony of people tweeting and Facebook’ing each other about the discovery. Bees are happiest when they have a clear purpose and daily mission. They get depressed and pretty lazy without a queen to give them focus, or their numbers are too small to maintain a colony. Bees are unlike their cousins the wasps, hornets and yellow-jackets, which have much higher aggressive traits developed from their predatory nature. The cousins also suffer from a much shorter colony lifespan, with the majority of the colony dying within a year of their creation due to natural imbalances and limited resource availability to sustain a predatory colony through the winter. The bees carefully store their nectar and pollen to preserve the colony’s food sources throughout the same period, allowing bee colonies to continue year after year. This becomes their primary purpose throughout their individually short lives (which is usually less than six weeks long) – to help each other to survive, so that the colony as a whole continues. The queen has a longer lifespan, but must continually deal with brand new individuals who know nothing from day one, other than to begin helping – clean the nest, feed the young, maintain the temperatures, keep out intruders, etc. Only towards the end of their short lives can they even sting and fly properly – and it is at that time they learn to gather and forage to build a food supply to feed the generations of the future. If you disorient a bee colony by moving its hive too many times in a row, or disturb them through constant disruption, they will become intolerant of the changes and seek more stable habitats. That is one feature that bees have that many humans would desire – the ability to fly away from their disturbances. However, in doing so, they must leave their entire known world behind. In this subtle way, bees have learned how to eliminate attachments to their possessions. In focusing on survival of their family and colony, their priorities are to maintain their family and queen leader in safety and health. Even if they must abandon all they have worked so hard to build, collect and store, if nature demands, they quickly consume whatever honey stores they can fit into themselves and depart for a safer and more secure place. The bees know if you can’t carry it with you, it probably isn’t that important. The term “africanized bees” started with a scientist down in the tropics cross-breeding European honey bees with local feral strains in an attempt to make a heartier and more disease-resistant bee. Tropical bees face many more difficult predators compared with their European cousins and have developed a much more sensitive nature in response to threat detection. Down in the African continent, the tribes for centuries have sought their honey by finding hollow trees with bee colonies in them and using smoke and fire to drive away the bees. 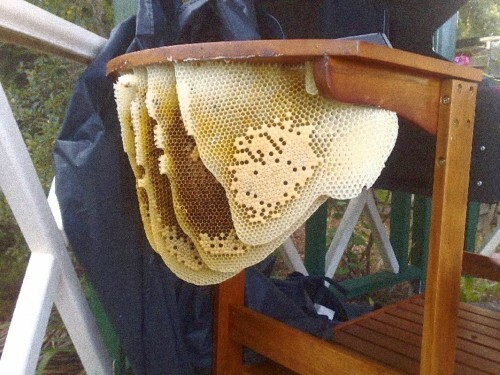 This has resulted in the bees developing an aggressive response to smoke – an opposite reaction to typical European bees that become very docile when they can’t smell anything due to the presence of smoke. Let’s look at things from the bee’s perspective. Bees sting only in defense, not because they want to attack, as they die in the process of doing it, so it makes no sense for them to form premeditated ideas about attacking other animals. Bees are eat honey, pollen and plant nectar, and have no particular interest in animals. Unlike wasps, hornets and yellowjackets which do prey on insects and animals for food, bees have a built-in instinct to protect their colony and will perish defending it from perceived harm. But ultra-sensitive or not, a bee simply defends its home from threats. Does this sound like a familiar behavioral trait, perhaps like that of an inner-city gang member or an ex-con from prison protecting their perceived home territory? Strangely, most bees won’t even defend themselves, if isolated from the colony. Instead they tend to stay quietly with the only purpose left to attempt to return home. Solitary bees accept that they have no defense, other than to fly and exhaust themselves, or attempt to sting, thus ending their life. Those that survive isolation do so by bringing pollen or nectar to contribute to another nearby colony. Without providing a contribution, a solitary bee cannot be accepted nor maintained, as the entire colony would become weak without contributions. And by nature’s design, a bee cannot survive very long on its own – perhaps 4 or 5 days before they succumb from low temperature exposure or simply being hunted by a larger or stronger insect or bird. In our pursuit for enlightenment as to how to return to harmony with ourselves and our world around us, we need look no further than the nearest flower, upon which you might find an example of nature’s most complex, and at once, most simple creatures – the honey bee. In their little efforts they industriously set the wheels of life in-motion by pollinating flowers and allowing plants to grow and multiply for every living thing on the planet. That’s how much of a difference a single action can make. 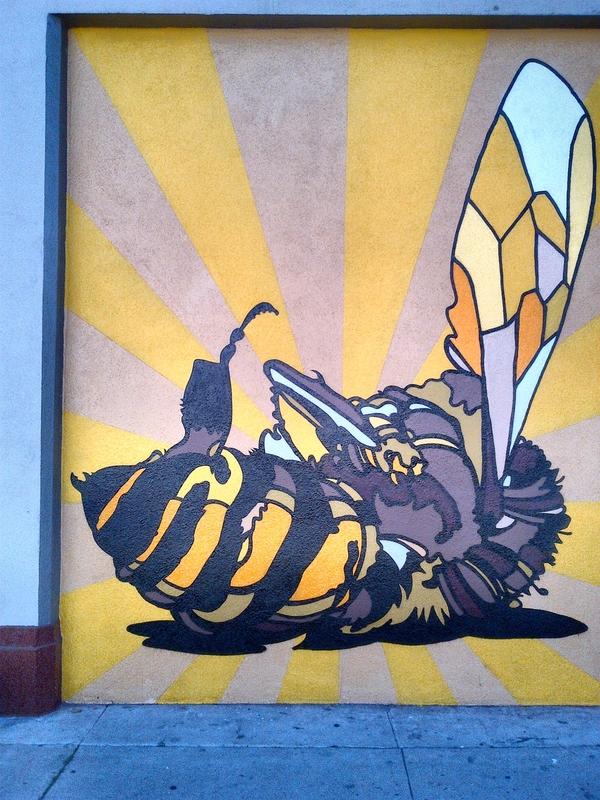 Shinnyo-en LA Bees – Buddhist Bees? Received a call from the office staff at my local Shinnyo-en Temple (Los Angeles/Yorba Linda) of bees having decided to move into an irrigation box near the Saito Homa field. Because the landscaper needed to adjust settings in the box, these bees needed to be relocated. Used minimal smoke and cleared brush around the box. Removing the lid caused 5 of the combs to disconnect as they were attached to the sides of the ground box walls. Placed the lid over the emptied cardboard nuc while deciding which set to move first. Cut the largest combs to the smallest from the lid first, since those were primarily honey and pollen stores. All combs maintained in order-of-removal when transferred to the deep frames with rubber bands to secure the combs in-place. Then proceeded with the ground box combs – several were ensnared in the irrigation wiring requiring delicate tearing to maintain primary comb integrity during removal. Once the largest comb segments were removed, remaining smaller combs were attached to the empty spaces remaining on the occupied deeps. Order of combs still maintained. Total effort about 90 minutes for a 14 x 9 hive of approximately 30,000 bees. Temperment was pretty mellow – while they did swarm around, I didn’t witness any dive-bombing or attack behavior during the cut-out. Keeping the bees on the comb during transfer helped a lot to keep the overall hive calm. Each time a frame was filled it went back into the box with the cover to keep sunlight to a minimum. Bees eat nectar, pollen and collect plant sap (propolis). Normally they eat a varied diet of many different flowers, plants and various flora. They live outside in tree hollows, under structures, inside walls, and many times even just hanging from tree branches out in the open where they survive just fine against all kinds of rain, snow, ants, mites, beetles, moths and whatever else the natural world throws at them. People decided to try and make more food producible from less land, so it’s cheaper (or more profitable, depending on how you look at it.) Monoculture developed (growing a lot of one kind of plant in an area). Insect-resistant strains of species were cultivated, engineered and distributed. Multi-spectrum insecticides were invented to combat the increasing number of insects that seemed to like our vast fields full of single-crop plantings (sort of like putting a CostCo where a 7-11 convenience store once stood). Until the robotic bees are perfected, in order to keep growing grains, fruits and vegetables, regular honeybees (apis mellifera) do the work of pollenating the fields. Even when trucked and transported thousands of miles into foreign soils and dumped on the grounds of vast monoculture plantings, they do their work. Because we like to work our fields during the daytime, and we don’t like getting stung by bees, we start promoting the more docile-behaving bees, and kill the queens that produce the “angrier” kind. Behaviorally, these “calm” and “easy to manage” bees also seem to have lackluster response to common bee pests, such as varroa mites, small hive beetles, wax moths and even ants. While their feral and “mean” cousins seem to be able to manage these pesky intruders by themselves, our “calm” bees seem to need assistance keeping their houses in-order, so we add miticide pads, screening boards, moth adhesive traps, and ant barriers to the mix. 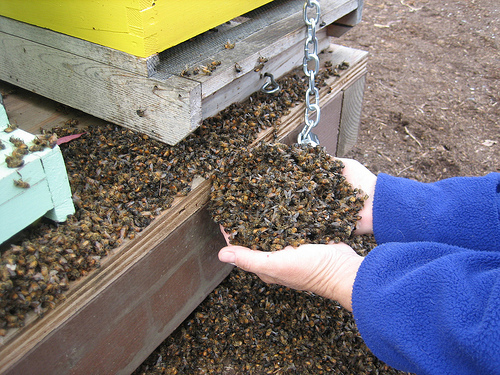 What we end up with is a “easy to manage” bee that is basically domesticated – that is, it’s lazy. 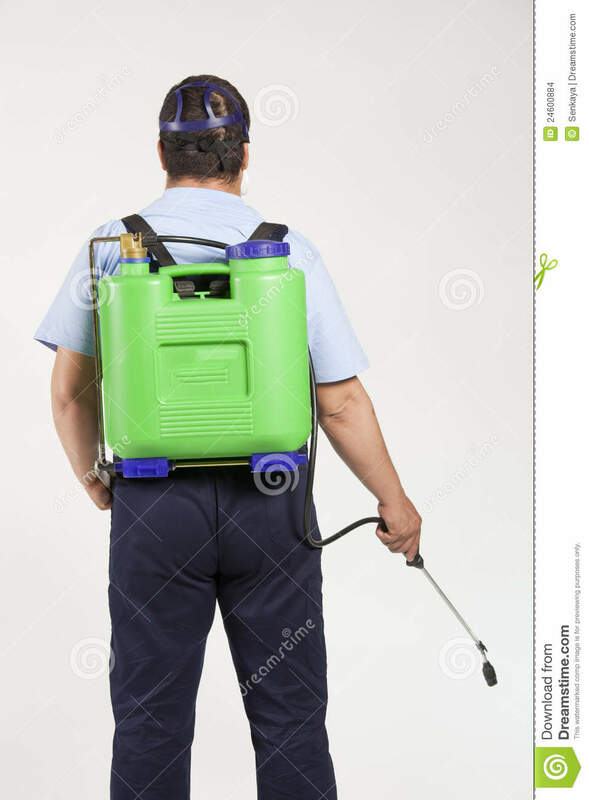 It lets someone else clean up the intruders and messes, isn’t very disease-resistant, and occasionally can’t figure out how to get home. 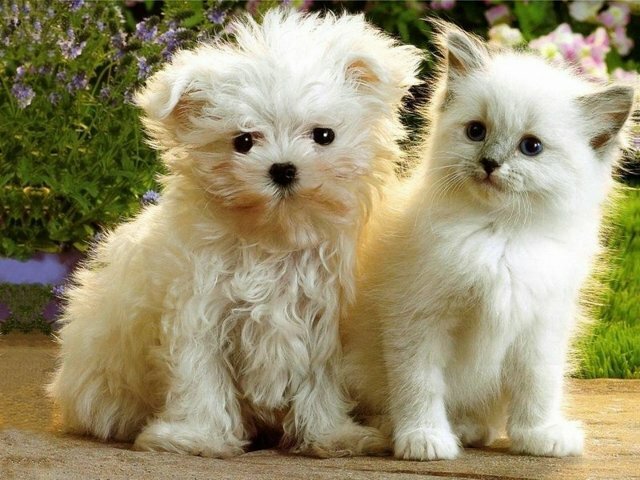 Sound a little like “Fluffy” or “Spot” at home? But bees are unusually resilient by nature’s norms – and they have wings. So if someone camped you out in a fast food place and said, “Here. Eat these burgers until you die 45 days from now,” and the burgers were making your digestion runny, and you seemed to get no end of colds, flu, and all sorts of skin irritations head-to-toe and were getting pretty annoyed by the number of moths and beetles that seemed to be liking your particular burger joint, and you had keys to a personal helicopter, what would you do? Go find better digs and fly away perhaps? The statistical surveys of bee populations within a state are based upon commercial bee hive and other registered control counts. Generally, in the past, they have ignored feral populations on the basis that they were not worth counting, any more than counting the number of houseflies around town. We, as Backwards Beekeepers, have noticed something very different happening. All the usual number of swarms are where they typically occur (trees, old sheds, people’s attics), but these populations are much more large and well-distributed within urban and suburban areas than in prior years. Let’s say you’re a bee. You notice that the local City seems to take very good care of their flower beds. 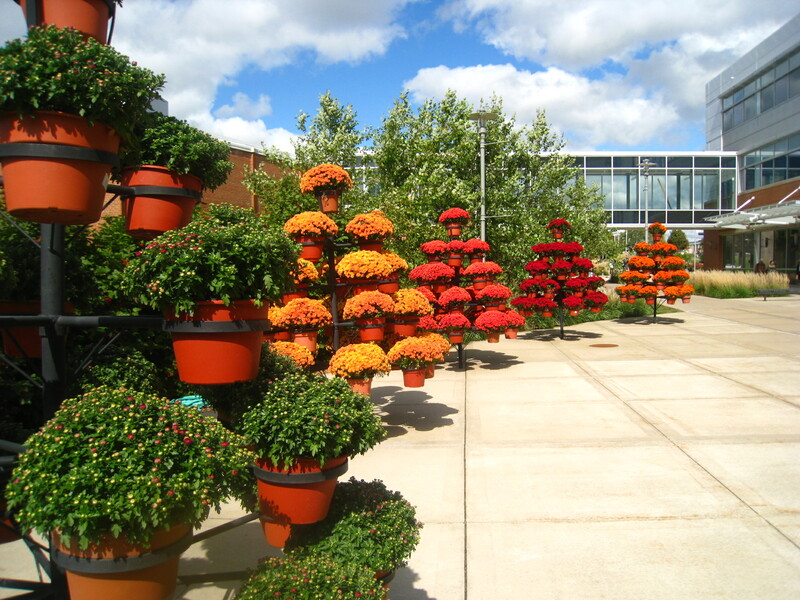 In fact, people seem to be planting beautiful flowers year-round, including removing other annuals, and re-planting new ones in their place just to keep the bed looking full of flowers. Home gardeners seem to be using fewer chemicals than before – because people are trying to grow “better quality” food at home than they find in their markets. Whole areas are void of the usual predatory yellowjackets and wasps because they happen to be areas where people don’t like such annoying insects and they’ve put out thousands of traps. Where would you go? We don’t count bees. But we do notice there are way more bees showing up in our cities and suburbs than have been in past years. And maybe all those field bees just got tired of getting shipped around the country and decided to move into the cozy suburbs instead. Of significance to this situation is in the majority of reported colony and hive “collapse” cases, dead bees are found only in small or insignificant numbers. We’ve seen what happens when a colony gets sprayed with insecticide – LOTS of dead bees. And the typical observation has been that they’ve “vanished.” How about they just flew away to greener pastures? But there might be one more domino-effect to the bees eating so many chemicals and becoming weaker – what happens to the animals that eat them? I was watching a PBS special, entitled “Saving Songbirds” related to wild songbird population reductions that have been observed more consistently over the past decade. Food chain. Coincidences usually are not coincidences. So, Jeremy’s Dryer Vent trap-out worked about 50% – they managed to be orderly enough to persist in slowly entering the trap-out cone one-by-one over the past 3 weeks. After taking the box down for inspection, some of the trapped-out bees had set up home inside and started caring for the uncapped brood and building burr comb to attach it to the frames and box walls. But with neighbors starting to complain about the buzzing, we decided to move ’em out. The vent has a 5″ x 6″ opening, leading to a 1.5′ x 1.5′ x 8′ non-functional space left open to the outside world. (and filled with not only bees, but also paper wasps, wood borer beetles and a couple of roaches). This was the result of a interior remodel, which should have included sealing-off or at least screening-off the opening. Putting in a borescope (from ThinkGeek) only showed a lens absolutely full of bees (rather curious bees poking at the LED lights and wondering what creature this was). Brought out the bee vacuum and captured most of the visible first layer off of the trap-out cone face, and those visible from the vent. There was about 1/2″ thick stucco surrounding which would cause too much siding damage, so we opened up the dryer vent using tin snips like a can, folding aside the flaps. Puffed in a little smoke, but the sound change sounded wrong, and I noticed the bees had vacated the entire first layer of comb when the smoke came in. So we put the smoker aside and instead decided to opt for the gentler sugar spray and leave them on the combs method. Inside revealed 7 – 6″ x 7″ combs neatly built parallel to the wall-face. All new comb, and about 1.5 combs of honey. Yuka had to vertically slice some of the combs to fit through the opening, but one-by-one was able to gently remove each comb, with most of the bees still on the combs. After all the combs were out, another session of vacuuming to remove the straggling bees and finish by foaming the vent with a backer board using self-expanding foam to keep out the future intruders.